So in previous pages, we've learned that a dominant allele masks a recessive allele, right? This is true in most cases, except where codominance or incomplete dominance involved. Codominance is when the two different alleles in a hybrid blend together, and the resultant phenotype is halfway between the two. For example, an imaginary red gene and yellow gene blend, making the offspring orange. Incomplete dominance is when the alleles are both expressed. For example, an imaginary blue gene and white gene combine, causing the offspring to be blue with white spots. Here's an example of codominance. The wool, or, fuzzy gene is recessive, denoted by f. A rabbit with two of the fuzzy genes, ff, has wool fur. 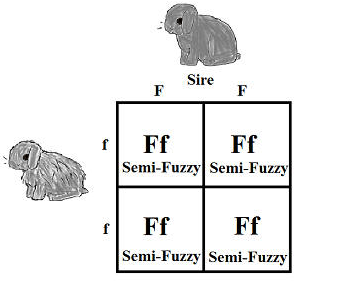 If a rabbit has two dominant, FF genes, then it has normal fur. A rabbit with Ff genotype has normal fur, but with a wooly texture. All of the offspring would be Ff, and be partially-fuzzy in phenotype.